Imagine running a few miles over the rocks, roots and staircases scattered along the treacherousAppalachian Trail. Now imagine running it without your vision. 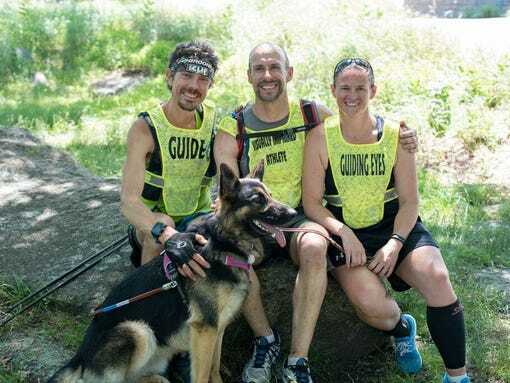 That’s what Guiding Eyes’ CEO, Thomas Panek, was able to accomplish Wednesday when he joined ultra-marathon runner Scott Jurek on Bear Mountain. Thomas Panek, who has been blind since his early 20s first ran with Jurek in the 2015 Boston Marathon, which they ran to benefit Guiding Eyes. Jurek was Panek’s guide for the 26.2 mile course, which they completed in 3 hours, 42 minutes. “Scott guiding me through Boston was an incredible experience,” Panek said. “But Boston was flat, and this was not flat.” Read the full story here.